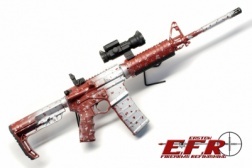 This is a take on a winter camo. We actually used green as the base color on this one, Then put white and browns over top. 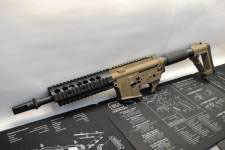 We were also careful to leave the muzzle brake a darker color so it doesn't constantly look dirty. 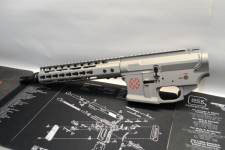 This is one where the customer wanted it re-done in black, But also said to do what we wanted after some flip floping on the colors and which parts to coat. So we did a custom mix using Cobalt as the base. It came out with a great hue. We always like to have a good contrast so we also left the plastic magpul accessories in black and coated a couple parts black to match. 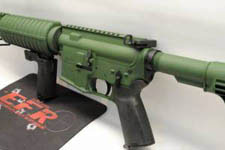 We coated a select few parts in OD Green on this build. It gives a good contrast to the OEM parts. 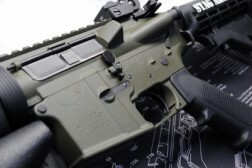 Here's an update on the Noveske AR receivers we did a while back. Richard got them put together and sent over some great photos. 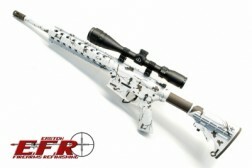 We coated part of this rifle in Titanium cerakote. 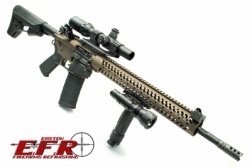 We coated parts of this SBR in Burnt bronze cerakote. 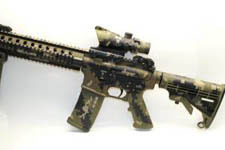 This Ar pistol was cerakoted in Desert Sand and Armor Black. 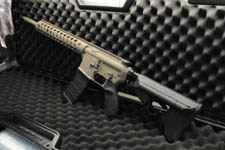 This Rifle was refinished in Burnt Bronze and Graphite Black Cerakote. 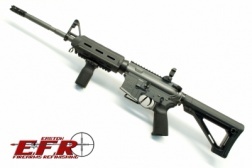 This is an AR we built using an LRB Arms Upper and Lower, Magpul Furniture, and a little Cerakote. 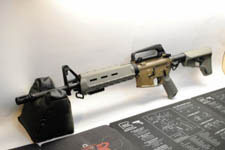 The Upper and Lower are in Magpul FDE, and the sight rail is in Armour Black. 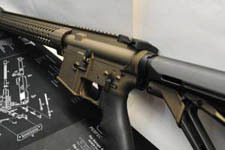 This AR-15 rifle was refinished in Highland Green for the main color and small parts were done in Graphite black. 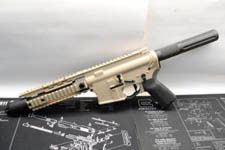 We Refinished the upper, lower, barrel and handguard in Flat Dark Earth. 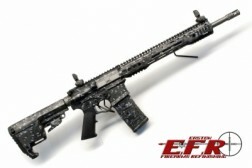 The result is a cool tactical rifle with an OEM look.